Hitch, pin & clip. Ballmount not included. CURT class 1 trailer hitches are the lightest-duty hitches of our rear mount receiver lineup. They are engineered for reliability, welded together with quality American steel and blasted clean for a smooth finish. 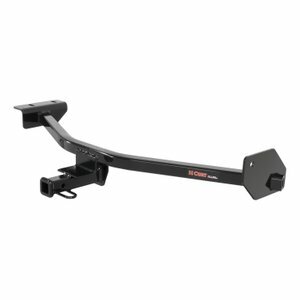 Tested to meet the strict demands of the industry, this CURT class 1 hitch has a capacity to tow up to 1,500 lbs. of gross trailer weight and 150 lbs. of tongue weight. This means it can handle a variety of small trailers such as single-axle utility trailers, canoe and kayak trailers, dirt bike trailers and more. It can also accept a hitch-mounted cargo carrier or bike rack, making it a very useful addition to cars with limited cargo space (NOTE: Never exceed the lowest weight capacity of any towing component; i.e. the vehicle, hitch, trailer, etc).Class 1 hitches feature a 1 1/4" x 1 1/4" receiver tube opening and are typically mounted on compact cars, full-size cars and some smaller crossover SUVs, minivans and compact SUVs. This particular hitch is designed to be a custom-fit trailer hitch for certain years of the Nissan Leaf (to verify your vehicle compatibility, see the CURT application guide at curtmfg.com). It features a square tube frame and comes with a hitch pin and clip and all necessary installation hardware.Each CURT class 1 hitch is co-cured with a liquid Aquence® coating and a high-gloss black powder coat finish that provide a lasting defense against rust, wear and harmful UV rays. Like all CURT receiver hitches, this class 1 hitch is made right here in the USA and is backed by a one-year finish warranty and a limited lifetime warranty. CURT is a leading manufacturer and marketer of top-quality towing products. The company offers American-made, custom-fit receiver hitches and wiring harnesses for nearly any vehicle on the road.